The University of Pennsylvania has launched a series of massive open online courses (MOOCs) on Coursera.org. 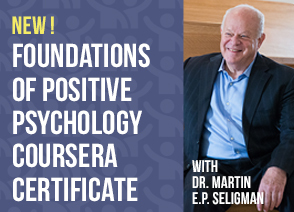 These courses can be taken individually or all together as part of a specialization in the Foundations of Positive Psychology. Sessions include: “Positive Psychology: Martin E. P. Seligman’s Visionary Science” taught by Dr. Martin Seligman (IPPA Board Member); “Positive Psychology: Applications and Interventions” taught by Dr. James Pawelski (IPPA Executive Director); and “Positive Psychology: Character, Grit and Research Methods” taught by Dr. Angela Duckworth and Dr. Claire Robertson-Kraft. Update: the specialization course “Positive Psychology: Resilience Skills” taught by Dr. Karen Reivich has become available for enrollment. The final course, “Design Your Life for Well-being,” a culminating specialization project, will be available soon. All courses last four weeks. Enrollment is open now on Coursera.org.